Vision of a patient affected by glaucoma. There are two types of glaucoma: chronic y acute. Chronic glaucoma or open-angle is the most common and dangerous. In this case, the intraocular pressure increases without causing symptoms. It usually appears when the patient is between 35 and 40 years old, so it is highly recommended to be tested for tonometry (intraocular pressure measurement) from this age on. Chronic glaucoma causes progressive reduction of the visual field without the patient realizing it. The central vision is affected only in advanced stages. Glaucoma is a treacherous disease and so it is known as the "silent thief of vision." Without proper treatment, glaucoma can lead to blindness. (Top Photo: Measurement of intraocular pressure). 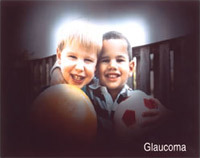 Glaucoma is a condition characterized by an increased pressure in the eye. Normal intraocular pressure is 10 to 20 millimeters of mercury. A clear fluid call aqueous humor is responsible for maintaining this. It is formed on the inside of the eye; and later passes through the pupil and drains in the angle between the iris and cornea. Usually, an increased eye pressure is due to drainage problems, with the aqueous humor accumulating inside the eye creating the pressure. This high pressure is then transmitted to the entire eye wall, with its weakest point being at the optic nerve level. If the intraocular pressure is high, it is necessary to examine the fundus to view the status of the optic nerve, test the visual field and measure the iridocorneal angle where the aqueous humor drains. Treatment for chronic glaucoma is simple, as it is almost always controlled with eye drops. If necessary, there is the alternative of conventional surgery and laser surgery. It is worth mentioning that the treatment is oriented to preserve the vision the patient has at the time of diagnosis, but not to restore lost vision. Therefore, it is best to diagnose and begin treatment at an early stage.